Gemmotherapy is a branch of herbal medicine that uses buds and young shoots of trees and shrubs. Gathered in the spring at a key stage of their natural growth cycle, buds and young shoots are freshly prepared and put in maceration in a solution of water, alcohol and glycerin to extract all their active principles. Gemmotherapy was discovered in the sixties by a Belgian doctor and then further developed by other European doctors. The fresh buds and young shoots are grown in the wild or in organic cultures far from possible sources of pollution. Most of the buds come from the Ardennes forests, in the South of Belgium where the laboratory is based. Buds and young shoots enclose all the genetic information of the future plant. In addition to containing vitamins, oligoelements, and minerals, buds and young shoots are richer in nucleic acids and growth hormones than other plant tissues. They also contain other active substances, such as auxins and gibberellins, which start to disappear after a plant reaches a certain point in its growth. 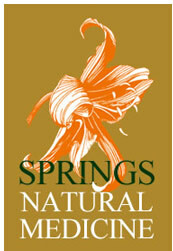 Springs Natural Medicine has in stock many of the gemmotherapys available. Contact us today for more information or to order Gemmotherapy tinctures. Given that they are extracts of developing tissues, gemmotherapy remedies combine the properties of the whole plant, including the flowers, the leaves, the fruits, the sapwood, and the rootlets providing key information and nutrition to address a variety of conditions and symptoms. Gemmotherapy is recommended to treat the underlying cause of the disease. Gemmotherapy works in a curative way to restore balance within the body and does not just treat symptoms. Extensive research and clinical experimentation has been carried out to identify the properties of different buds and determine their main indications. Research studies have tested and compared each of the different species within the genus to determine which one has the highest pharmacological effect.